Please refer to our stock # rjp1 when inquiring. 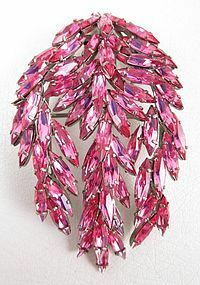 This amazing vintage clip/pin was made by couture designer jeweler, Roger Jean Pierre. He created jewelry for many couture houses including Schiaparelli, Dior, Madam Gres, and Balenciaga to name a few. The clip is 3 1/4" long x 2" wide and is quite dimensional standing about 7/8" tall. The front is intricately set with pink marquis rhinestones, and the reverse is signed "Depose" on the clip mechanism. It is in excellent condition.